The first mutant to join Professor Xavier's X-Men, the combination of Scott Summers' incredibly powerful optic blasts and keen tactical abilities make Cyclops a force to be reckoned with in any battle. When you consider how often the X-Men change their uniforms, it's pretty impressive that Scott Summers kept this one for an entire decade. It was designed by Jim Lee, back when random straps were just starting to become his "thing." The Minimate probably could have gotten away with painting those straps on, but making them 3D pieces adds weight to the figure. The black detailing on his chest is thin and crisp. Scott's visor is gold, rather than the yellow used for the rest of his costume. Why was that choice made? It doesn't blend properly. If you remove the visor, you'll find his ruby quartz glasses beneath - way to double-bag it, Slim! He has replacement hair, but amusingly, it's parted on the opposite side from the hair sticking out of his mask. 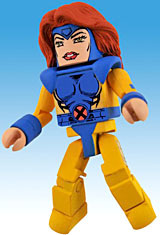 With both telekinesis and telepathy at her command, Jean Grey uses her mental powers to fill in for Professor X in the field as well as to keep all members of the X-Men in constant telepathic contact. 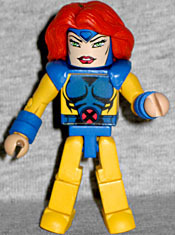 At last, Jean Grey in what is hands-down her most iconic costume! For an entire generation of comic fans, this is the Jean Grey look. 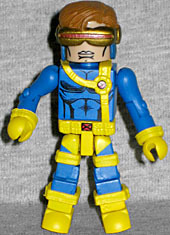 It's a yellow bodysuit with a blue stripe down the center - a reversal of the classic X-Team look. She's got blue bands around her wrists and triangular pads on her shoulders. We'd go so far as to say this is one of the best costumes Jim Lee ever designed. The prototype photos show yellow paint on the hip block, rather than solid blue, but that's not a change that hurts the figure - it just makes her belt look thicker. Jean's hair is a big new piece, and her face is painted with the demi-mask she wore back then. The only thing we would have liked to see? A second "ponytail" hair piece to create her look from the '90s cartoon that made this design famous. The only other choice for extras would be, what, pink energy effects to show her powers? Yeah, no. When Jim Lee redesigned the X-Men in the '90s, he gave them a series of individual costumes, not a set of uniforms. And out of all of them, Scott and Jean were the only ones who stuck with the traditional blue and yellow. Looks like Wolverine should have taken the hint.